Macfadyan tried to get back to sleep but it was impossible. Every time he closed his eyes, the insane echoing laughter of Death would creep into his ears and the insane faces he witnessed would peer through him and into his soul, not liking what they saw. In a matter of moments, the dream, that had seemed so real, was a rapidly fading echo of what it once was until it settled into a disquieting memory. After an hours tossing and turning, he threw back the bedclothes, got up and splashed some water on his face from the sink in the bathroom adjoining his personal quarters. Hastily throwing on some clothes, he made his way to the control room. He had an unaccountable desire to be around people at that moment and he craved the company of his shipmates. He entered the control room to see Blanche, Colin Curtis and Cre’at excitedly talking amongst themselves as they looked at an image on the viewscreen. Blanche turned around at hearing Macfadyan enter the control room. A delighted smile lit up her face and she rushed over to him to usher him towards what the others were looking at on the screen. Macfadyan was too preoccupied with his own thoughts until he noticed Blanche tugging excitedly at his jacket sleeve. Macfadyan shook his head slightly to dispel the last lingering images of the dream and peered down at Blanche who was looking up at him with an excited, expectant look on her young face. Blanche lead him to the viewscreen and he peered closely at the sight that was presented to him. What he saw was a cityscape like none that he had seen before. 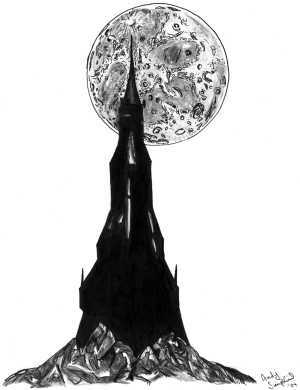 Tall, almost cylindrical towers thrust their way into a star-speckled night sky. They were a uniform dull steel grey in colour and were connected to each other by a series of walkways and gantries. There were very few windows in them and what ones were present, only a few had illumination coming from them. He could see no vehicular traffic and no air-borne craft to speak of but he did see a few pedestrians on what could be loosely described as the streets. They were humanoid in appearance but, in contrast to the bustling streets of the many planets he had visited where people milled about, stopped to converse with friends or just ambled about to take in the view, these inhabitants all had one thing in common; they all walked with a quick, almost furtive pace, pausing only long enough to cast worried glances around them. It was as though these people were living in the shadow of a dormant volcano; one which could erupt at any moment and he could almost sense a palpable sense of relief as one of them darted into a doorway of what he presumed to be their home dwelling. It was somewhat akin to a broadcast he had seen once when he was on Earth. What he had seen was a documentary about the gazelles of the vast plains of the Serengeti. They too, lived their lives out on the savannahs but they were ever watchful, knowing only too well that predators were not too far away and that death, in the form of slashing claws and teeth gripping their throats, was only the blink of an eye away. As he was studying the view on the screen, Colin Curtis had walked over and stood by his side. He was a tall, lean man, with dark brown hair in his late thirties who had spent most of his adult life in the armed forces until he was recruited by UNIT and sent on this, his most important mission, to accompany Macfadyan and his colleagues on their travels through the endless regions of time and space.